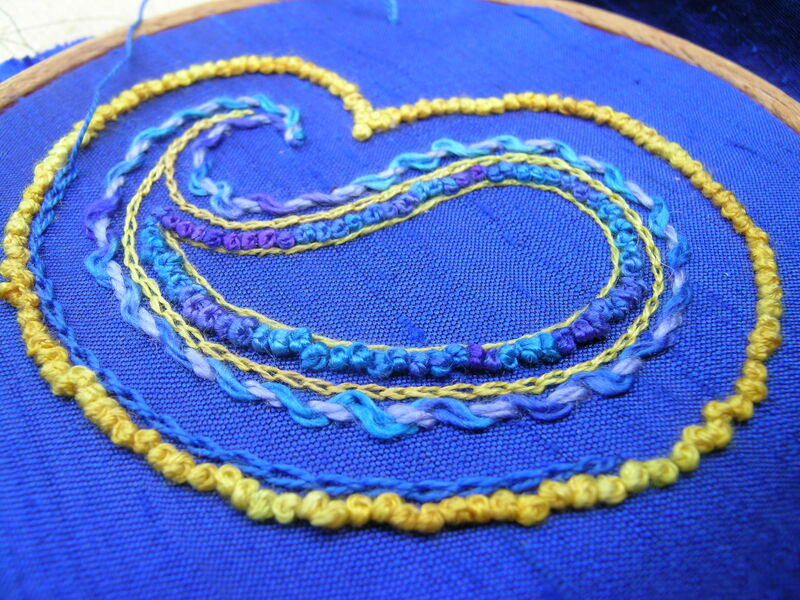 I’ve just got the interlaced border to complete and as I’m enjoying it, I’m in no hurry to finish! 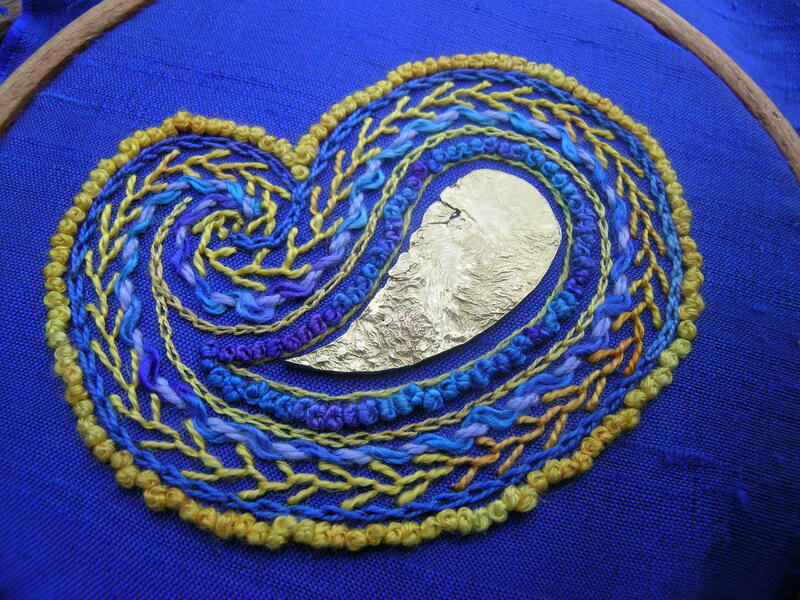 One other very lovely thing that happened at last week’s meeting was that I received my prize for winning the Yorkshire and Humber Embroiderers’ Guild regional competition for a piece of embroidery to be made up into a card: this fabulous book. 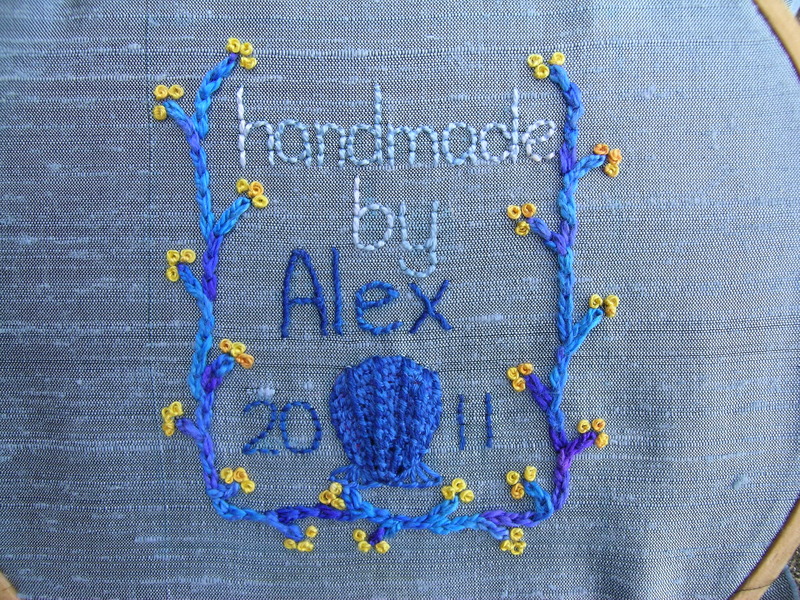 For our July branch meeting we were asked to submit pieces of embroidery for the Regional Competition, the idea being that one piece would be selected from each branch and those pieces would go on to the regional AGM to select a final winner. 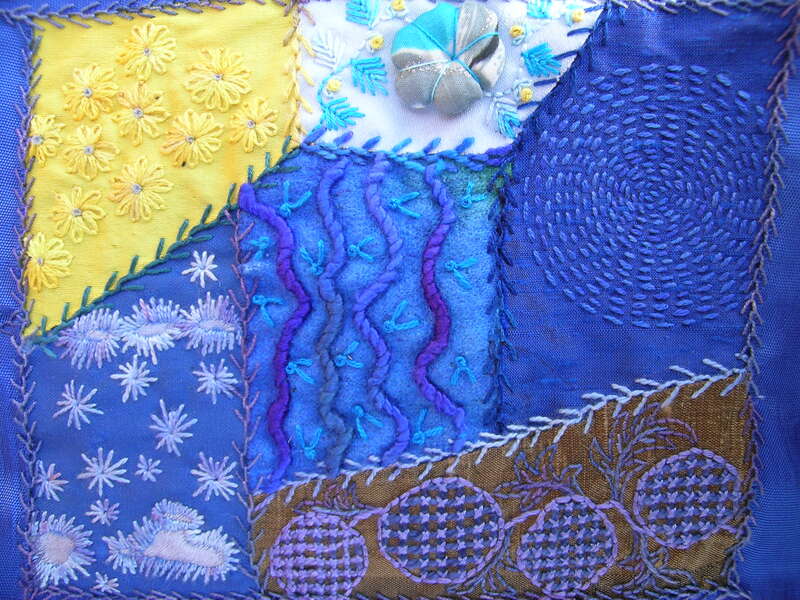 I entered my North Cornwall Wallhanging, a piece of crazy patchwork that I pieced over several summer holidays in Cornwall and finally made up a few years ago into a hanging. I’ve blogged about both the individual pieces and the making up and if you’re interested you can search ‘North Cornwall Wallhanging’ and find a load more posts and photos. Anyway, to my utter amazement it was selected by Scunthorpe branch and taken off to the the regional AGM where it was chosen as the final winner. Apparently, because there is so much going on, instead of just having one design, they are going to choose different areas and do several. I know which bits are my favourites, so it will be interesting to see what other people choose! 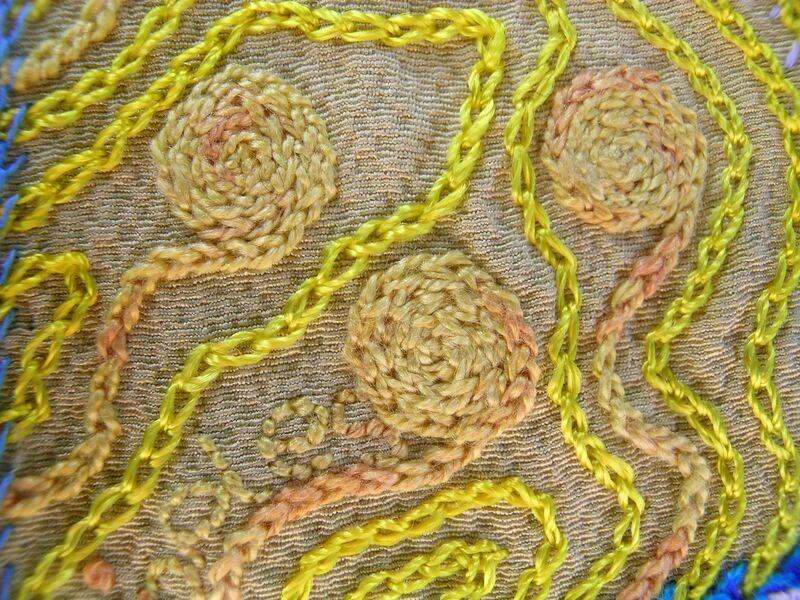 So after the first failed attempt to attach a reticulate brass disc with shisha stitch I decided to embroider a paisley design with the disc at its centre. 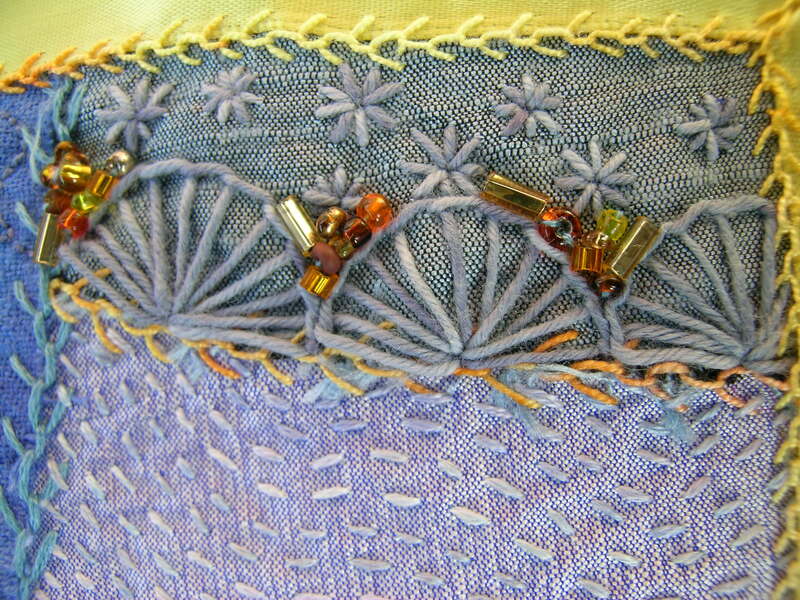 I used a design I’d found on the internet that I liked and because the sapphire coloured silk I was using was too dark for me to mark the design onto it, I stitched three elements straight through the paper: a yellow silk split stitch inner shape, running stitch (to whip later) in the middle and yellow silk french knots round the outside. I tried the disc in place but with everything else following the paisley shape, it looked wrong, so I cut a piece of reticulated brass to match the central shape. Laid in place to get an idea of the finished piece. 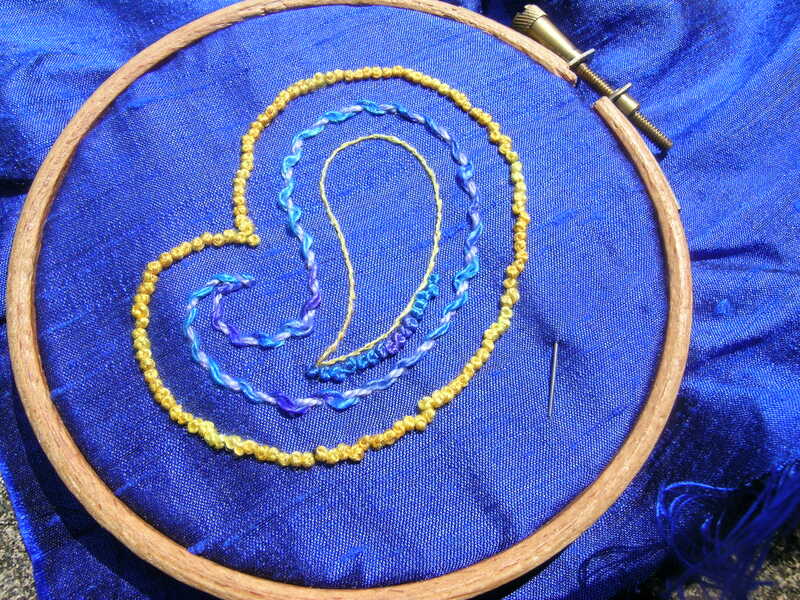 Just some french knots to add, the brass to attach and the finishing to do. 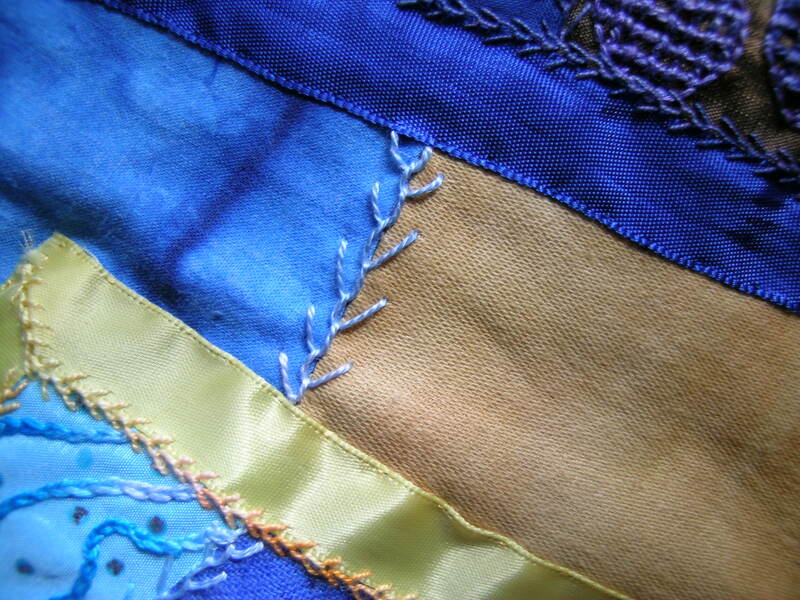 Having invisibly stitched the ‘postcard’ blocks down on the front of the hanging I was pretty sure I didn’t want to feather stitch them – it would have been too busy. 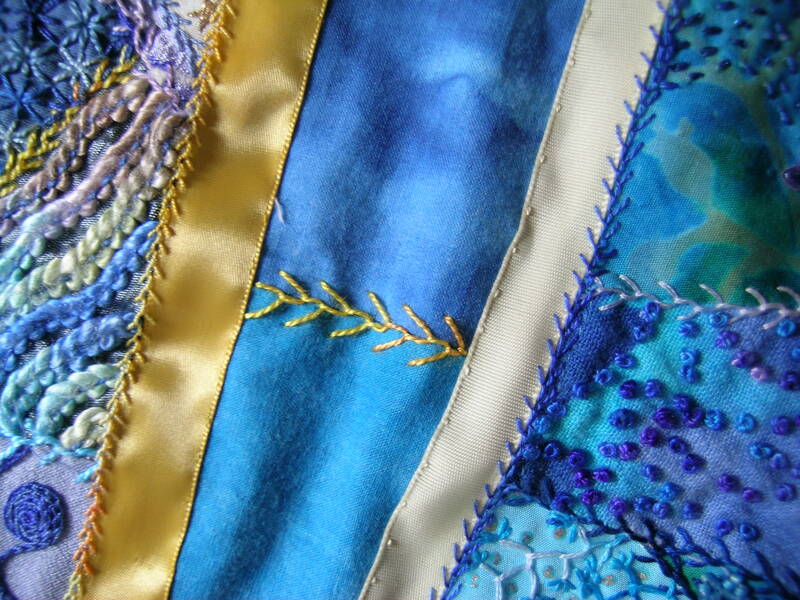 But I did want something else on the front and so I decided to feather stitch along the seams of the backing. All variegated or hand dyed. 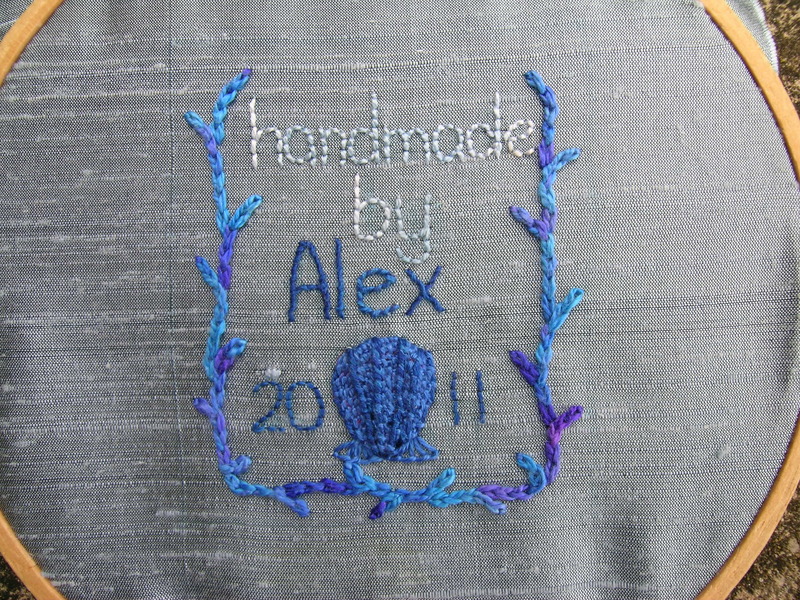 Then I machined on a backing of lightweight blue cotton with a matching hanging sleeve, attached the label and went upstairs to the spot where I wanted to hang it. It’s now draped over the blanket box in my bedroom while I work out Plan B, but every time I walk past it it gives me pleasure: isn’t that the point? 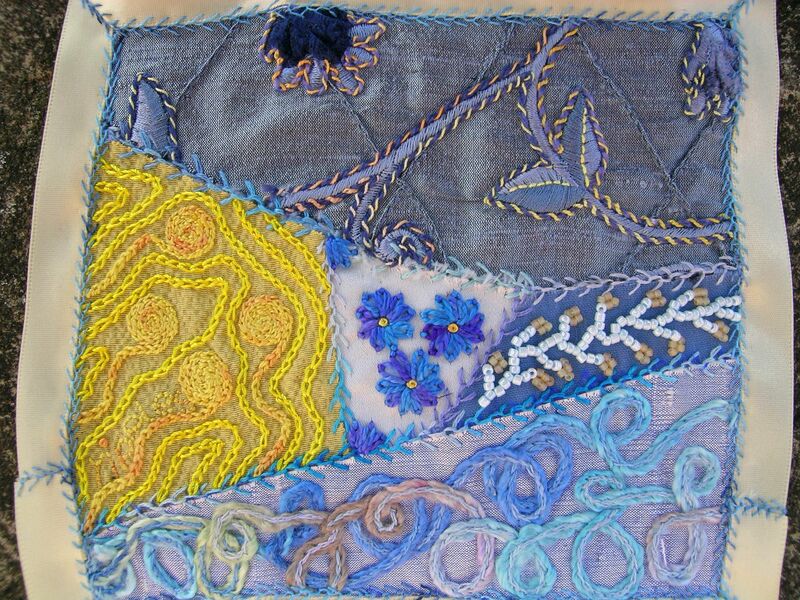 I know what textile art in the house is my own work, but when my youngest attributed a large machine embroidery hanging by the Cornish artist Karen Howse to me several months ago, I decided that if only for the family’s benefit I would try to sign and date my work. For the North Cornwall Wallhanging I decided to make a traditional quilt label by adapting one of the designs from a Bareroots Quilt and Stitchery labels pattern I picked up on eBay a while ago. 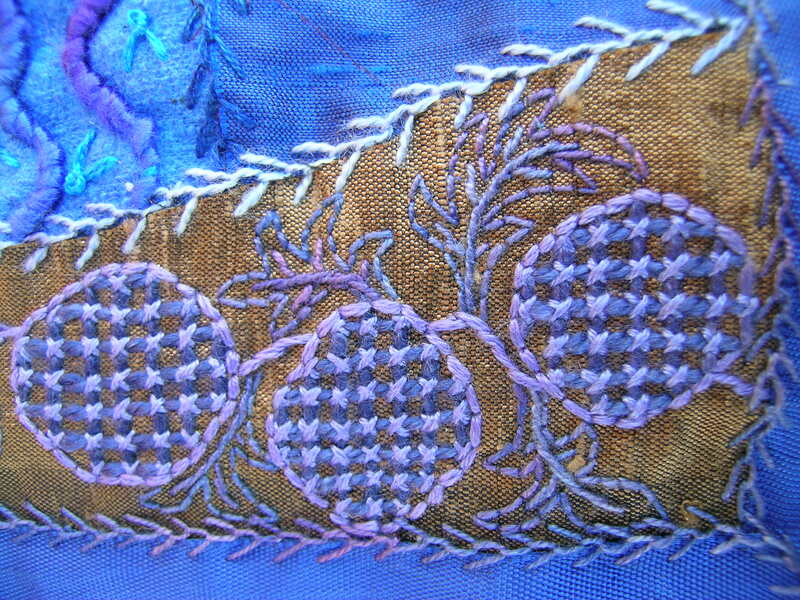 It’s stitched on some of the same silk dupion I used for part of the front of the hanging in a mixture of hand-dyed cotton perle (for ‘handmade by’), stranded Gloriana silk (for ‘Alex 2011’) medium weight hand-dyed silk for the border and coton a broder for the seashell. 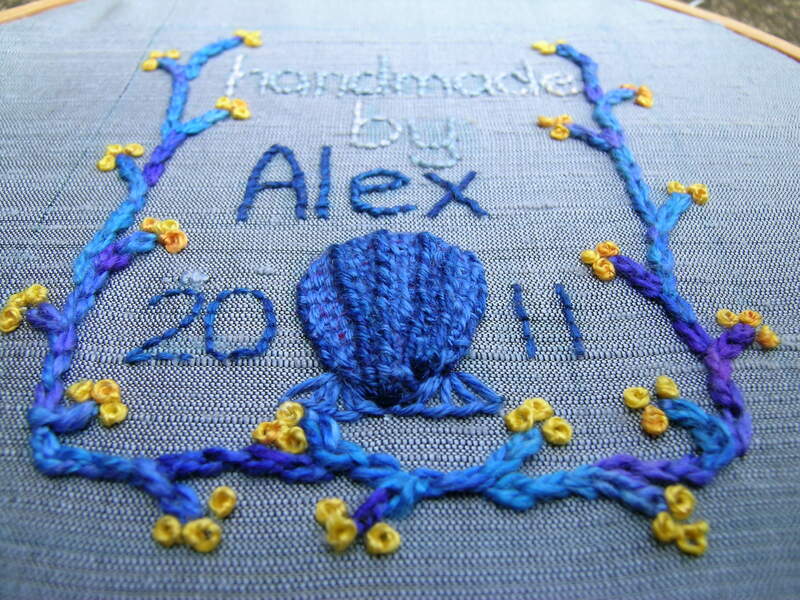 I think the original design had a heart at the bottom but I wanted to continue the sea theme that plays such a big part in our holidays to Cornwall and the memories stitched into the blocks on the front so I decided to replace it with a stumpwork scallop shell. It’s padded with dark pink felt (I started it at a rehearsal and that was all I had in my bag!) 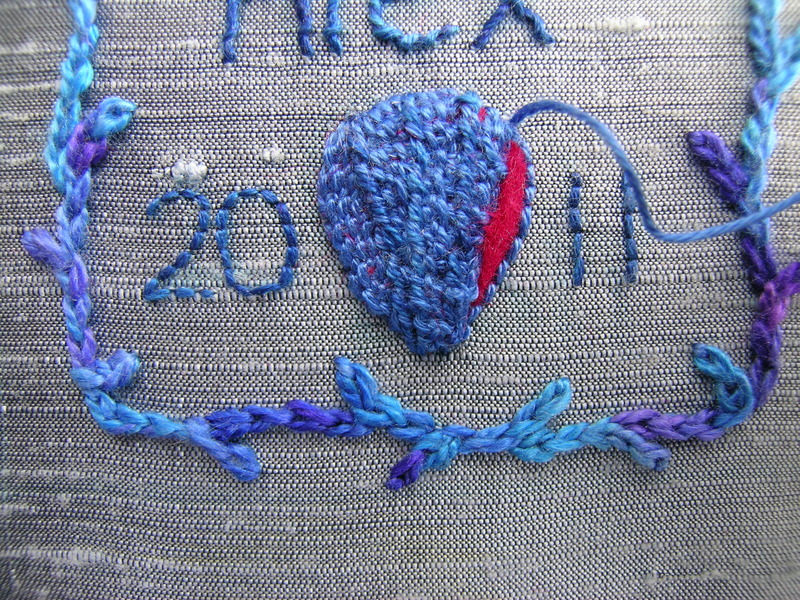 and then I backstitched radiating lines along it to keep it in place and also as guidelines for where I wanted to put the ribs of the scallop later. 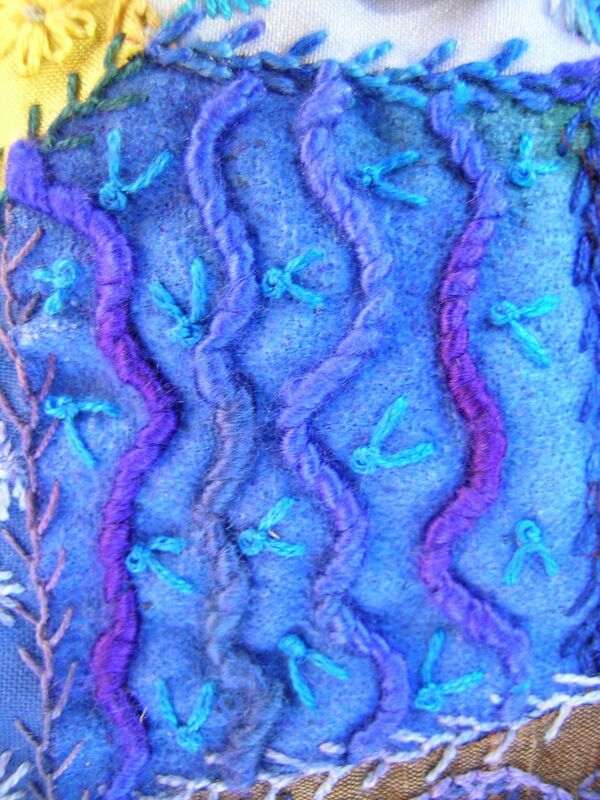 In between the ribs I worked rows of Corded Brussels Stitch to cover the felt. 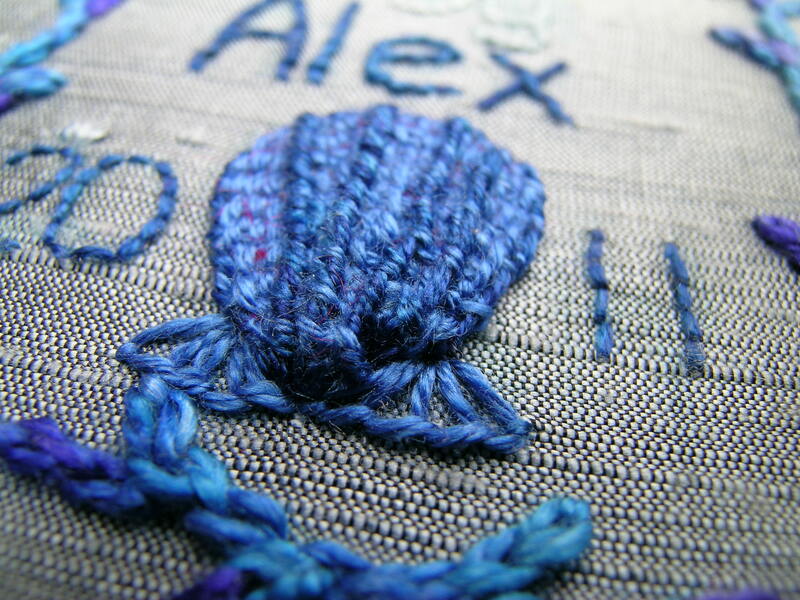 the little ‘wings’ at the bottom are buttonhole stitch fans. The ribs were then whipped with a slightly darker coloured stranded cotton. to make them stand out. 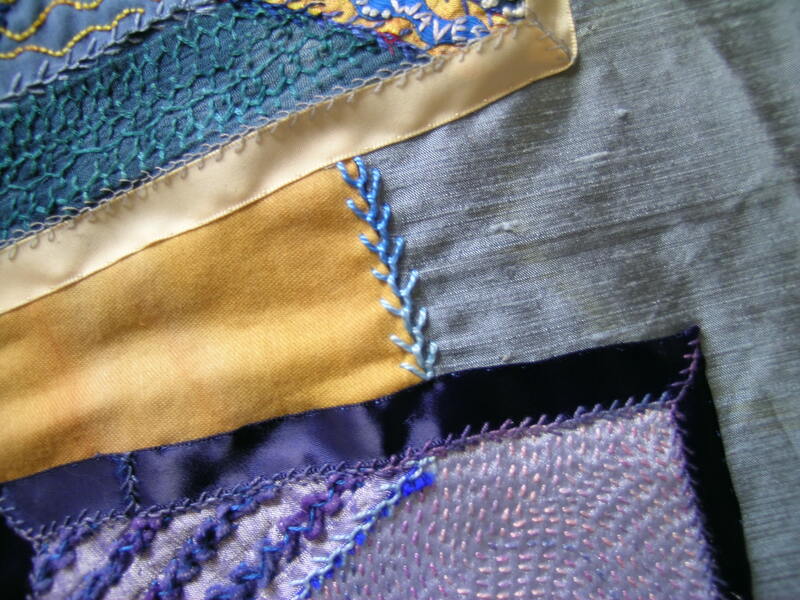 Keeping them straight when all the stitching is raised and textured was difficult! 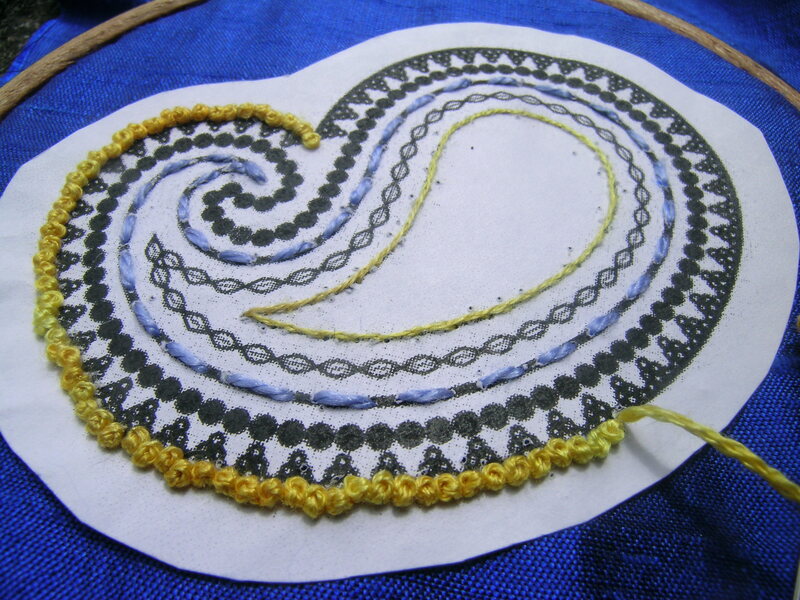 Finally, french knots in some of my favourite yellow medium weight silk. 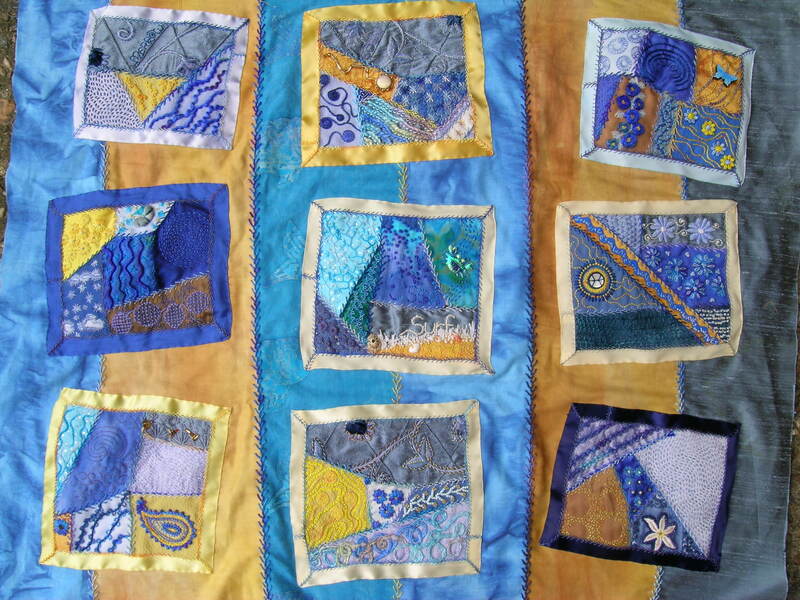 The original design had just one at each ‘stalk’ end but that looked a bit sparse so I went for trios with the gold and blue scheme echoing the colours on the front. 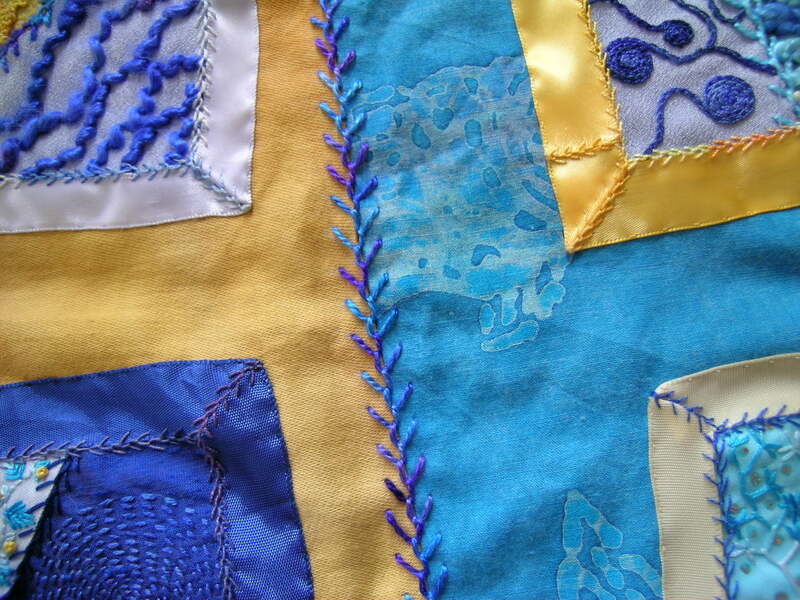 Ready to be mitred and stitched onto the back of the hanging. 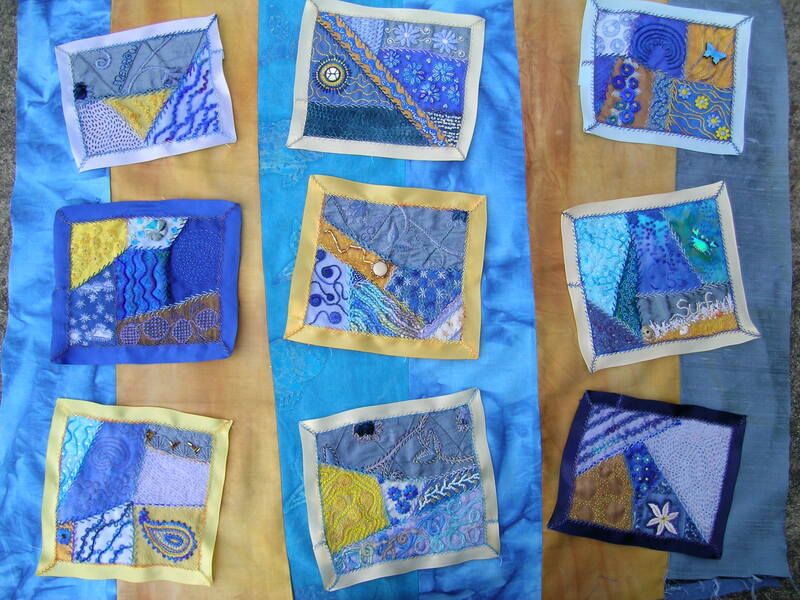 The last two blocks, although the backing isn’t going to be pieced any time soon. The Victorian melodrama I’m directing for the Scunthorpe Little-Theatre-Go-Round is taking up most of my free time as we’ve only had 3 very intense weeks to rehearse from casting to first show and I’ve also been asked to do a ribbon embroidery activity for our Embroiderers’ Guild Members’ Day in July. This was one of the earliest blocks to be finished. 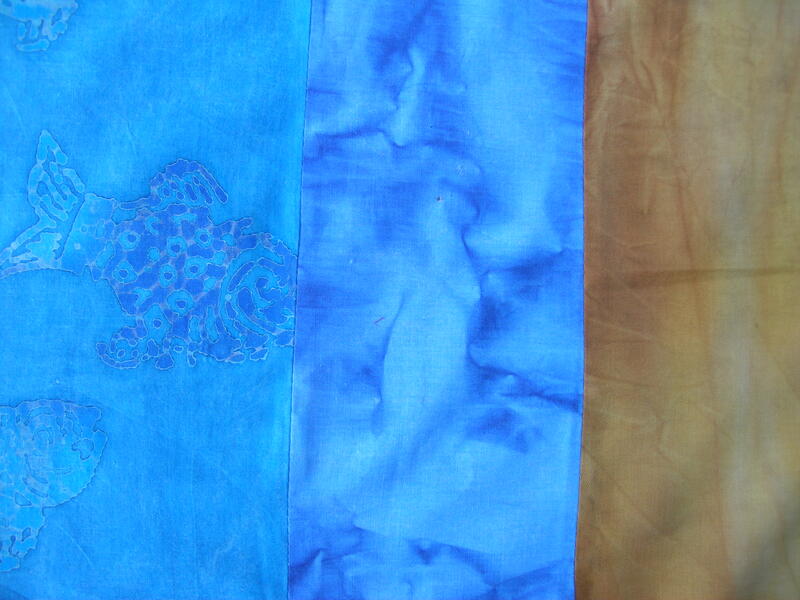 Mostly silk fabrics, including silk satin, silk dupion, commercial embroidered dress silk (at the top, outlined with whipped running stitch in blue and variegated orangey-gold thread) and some more of the Japanese silk crepe. 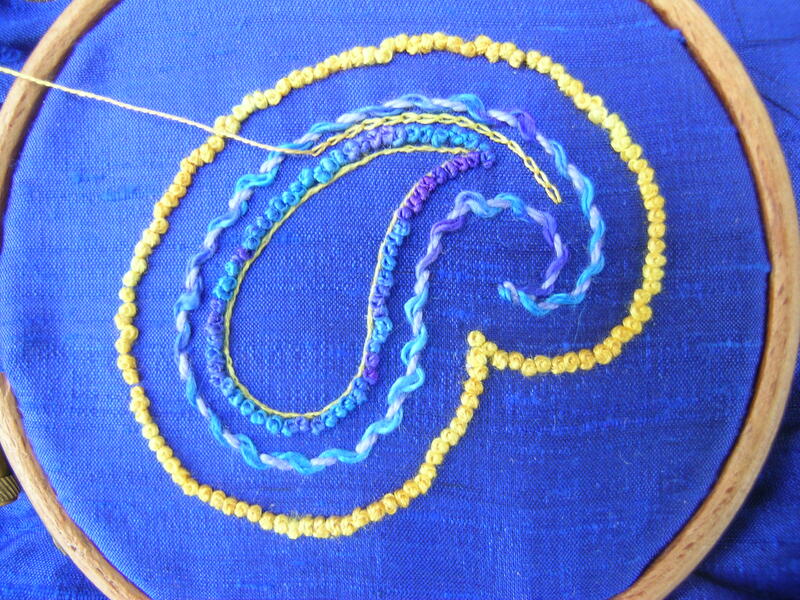 Winding and unwinding chain stitch spirals. I’d forgotten there was also a hidden word in this block until I looked at the close-up pictures. In this case, part of the word ‘ripples’ in the bottom left corner. 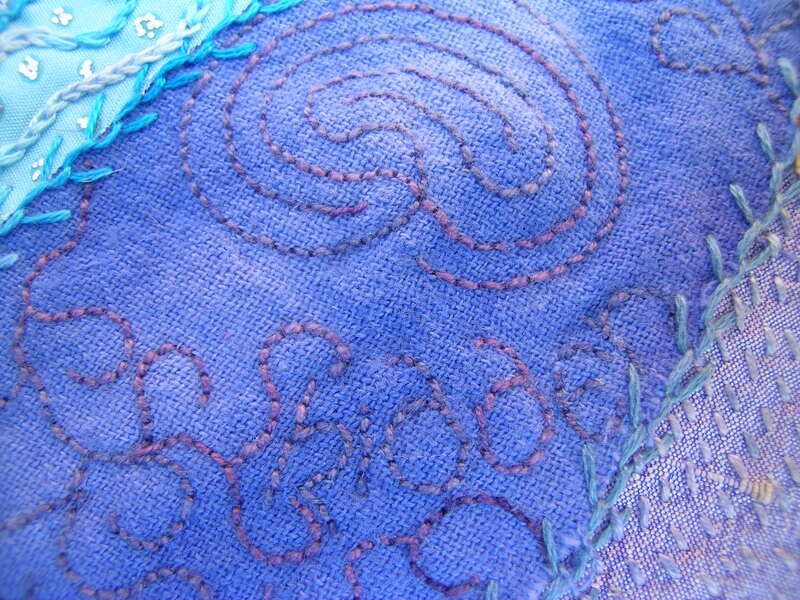 Random coils of thick soft pure silk thread stitched down with the centre with split stitch. Beaded feather stitch. Surprisingly simple to work (just like normal with beads threaded onto the working thread) and very effective. 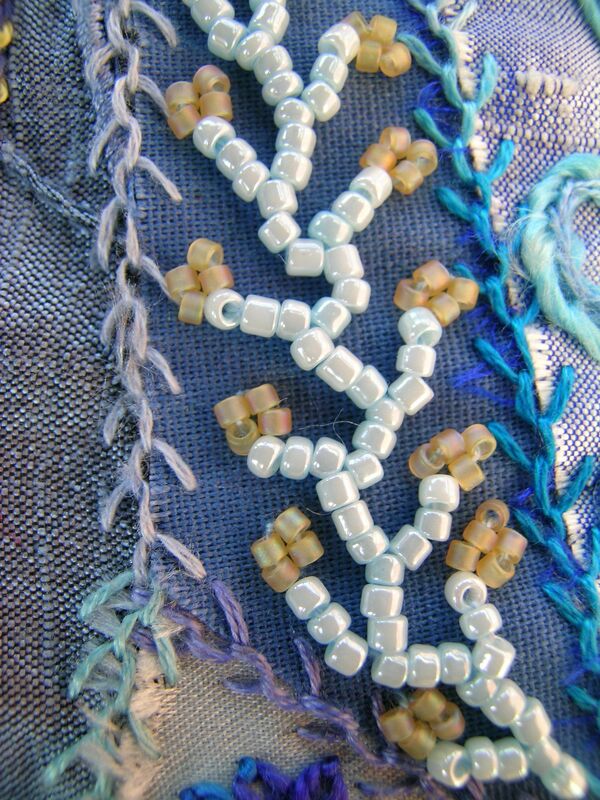 The golden bead clusters on the end of the arms were added later. The last block to be finished. 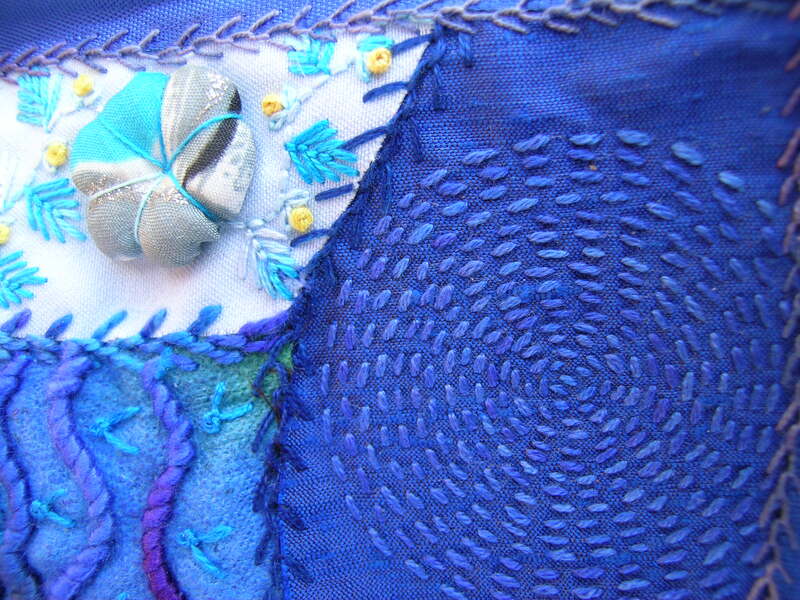 The holes (there is a pale blue satin behind) were already there, worn by the stitching and the action of the sea. 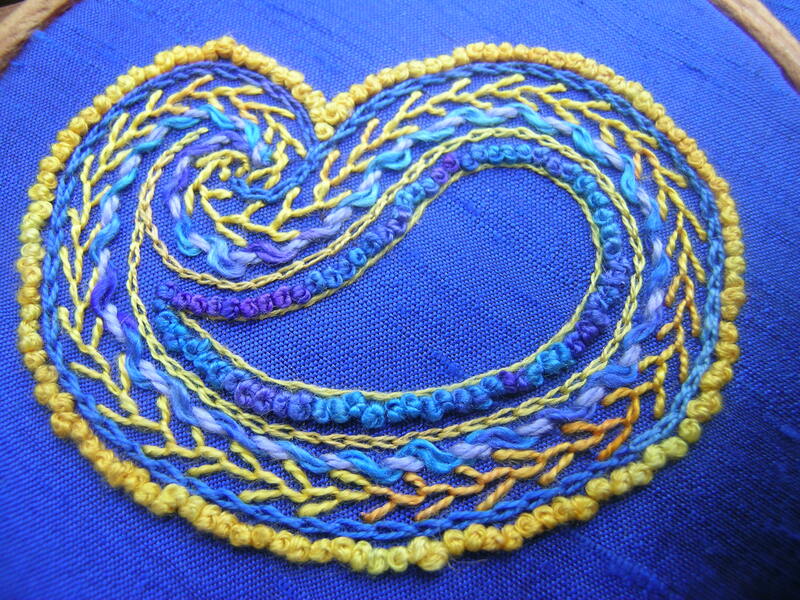 I just used straight stitches in hand dyed perle to emphasise them. 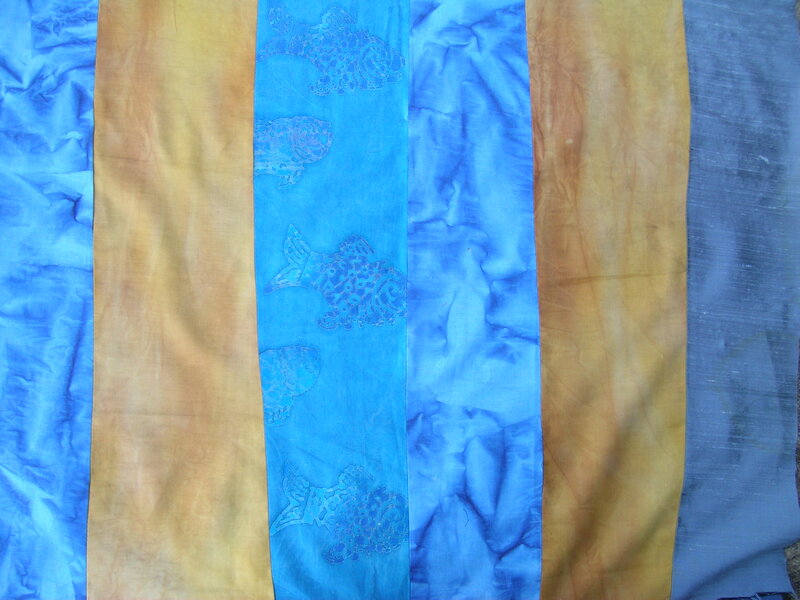 The kantha stitched spiral is in Gloriana silks on silk dupion. 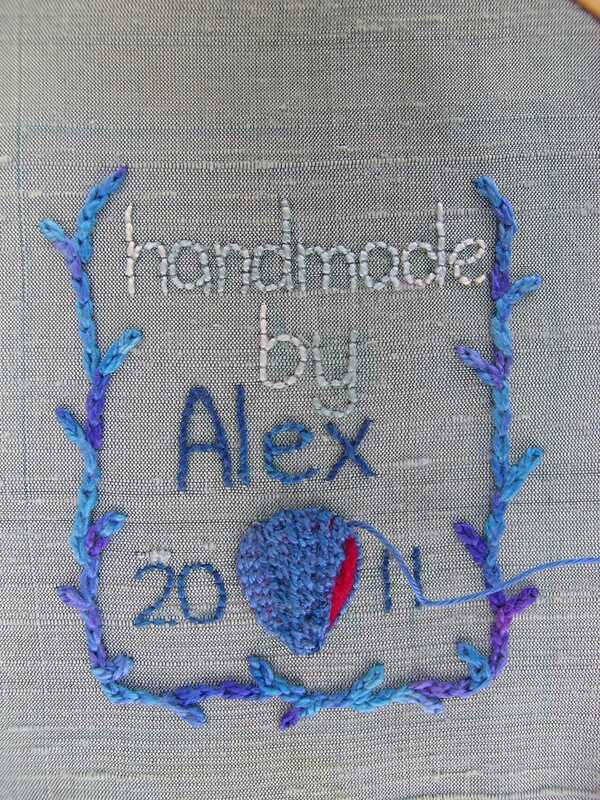 Very pleased with it as it’s completely stitched by eye. 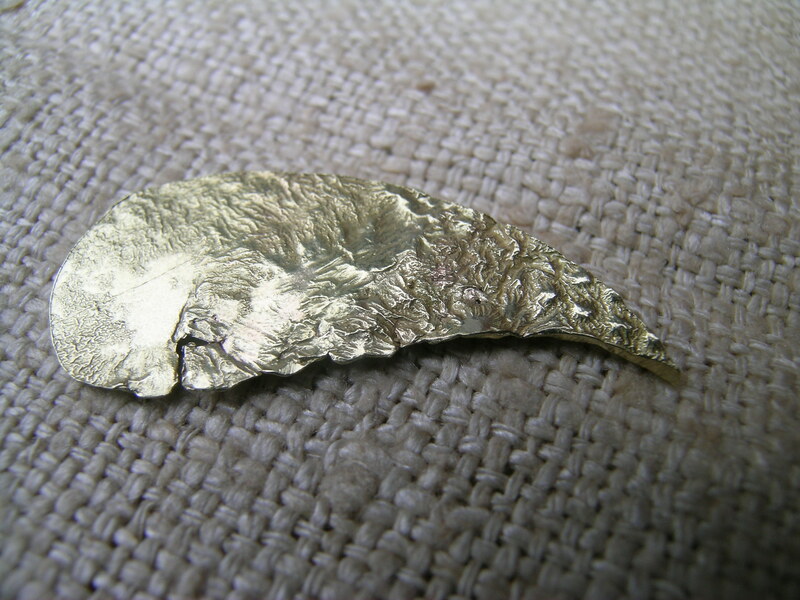 This was where I first tried out Jacobean laid work before I used it in one of the alliums for my Allium piece. 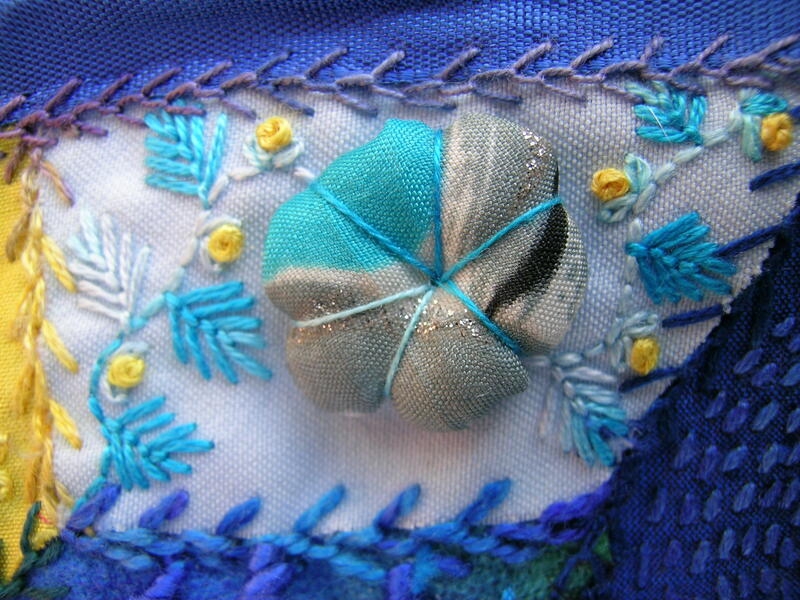 A stuffed puff, again, precursor to the puffs I used here from a scrap of fabric with fly stitched leaves and french knot buds. All finished, all edged with ribbon and all put aside while I get on with the more urgent priorities! This is another favourite block, mainly because of how neatly and evenly the labyrinth turned out. I also love the way the text in this block is appropriately ‘hidden’. Close up of the labyrinth with the text (written in half uncials) hidden in the swirls. 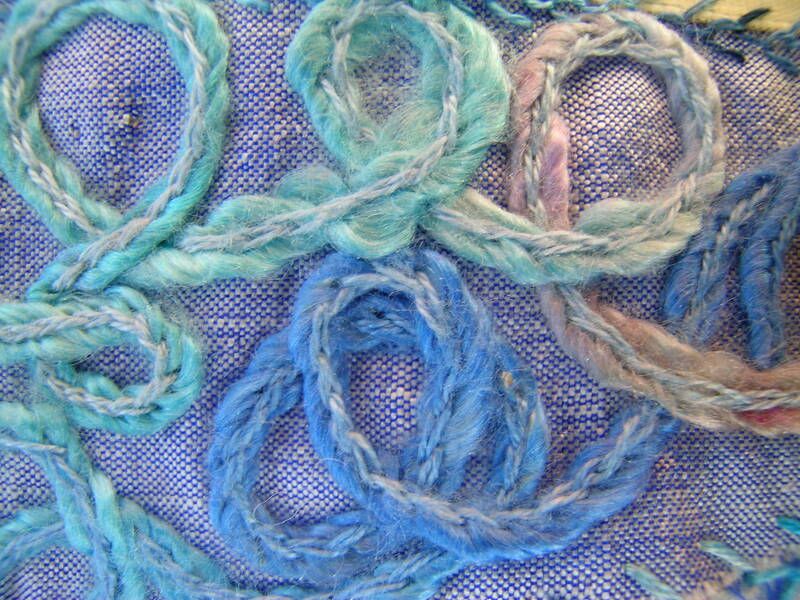 Space dyed cotton thread on cotton. 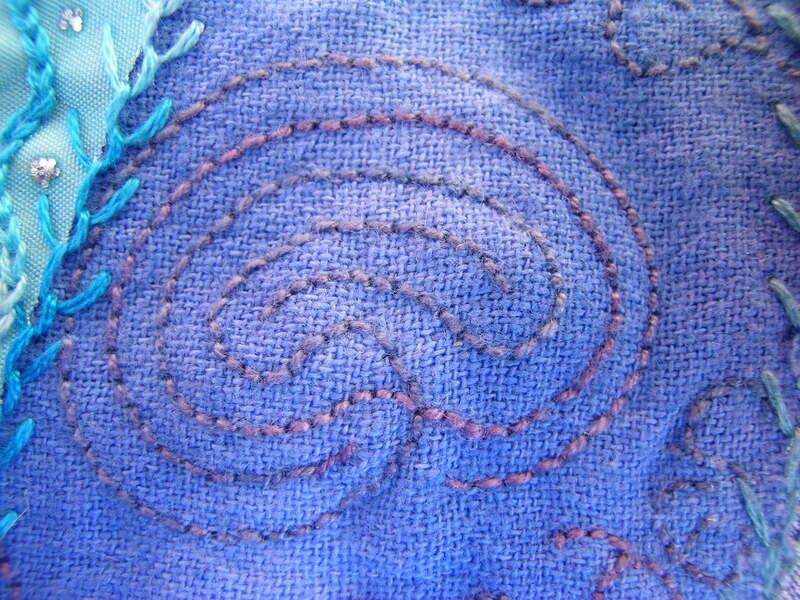 Backstitched labyrinth detail. In a hidden valley near Tintagel there is an ancient labyrinth carved on the rock. I love the simple five path labyrinth pattern. 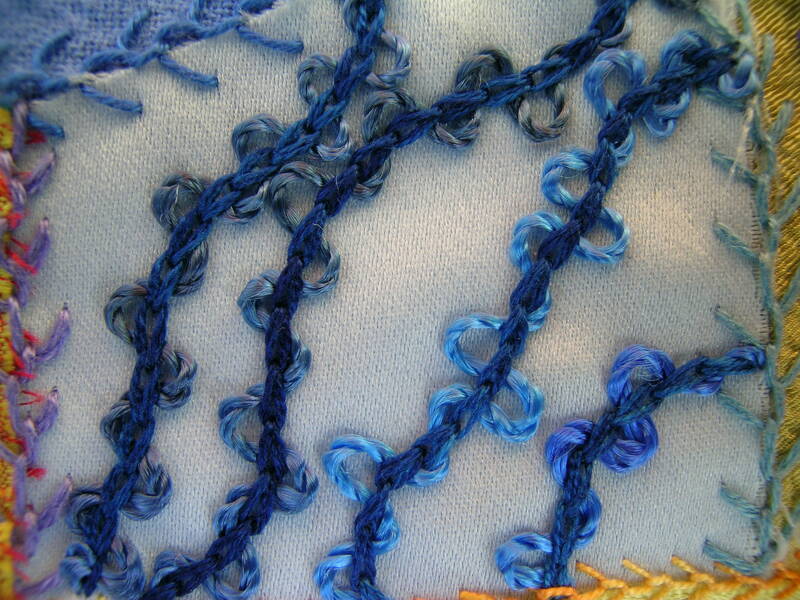 Chain stitch loosely laced with rayon thread. 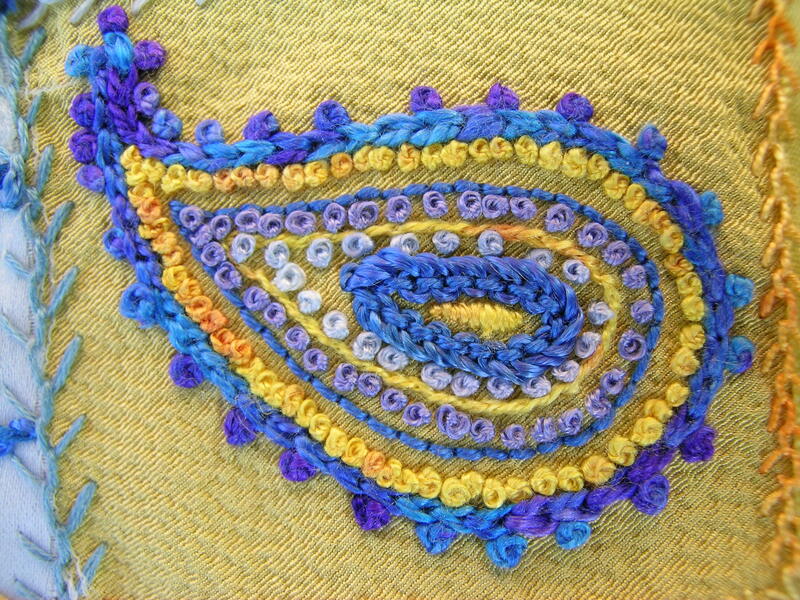 Blanket stitch half wheels with bead clusters. 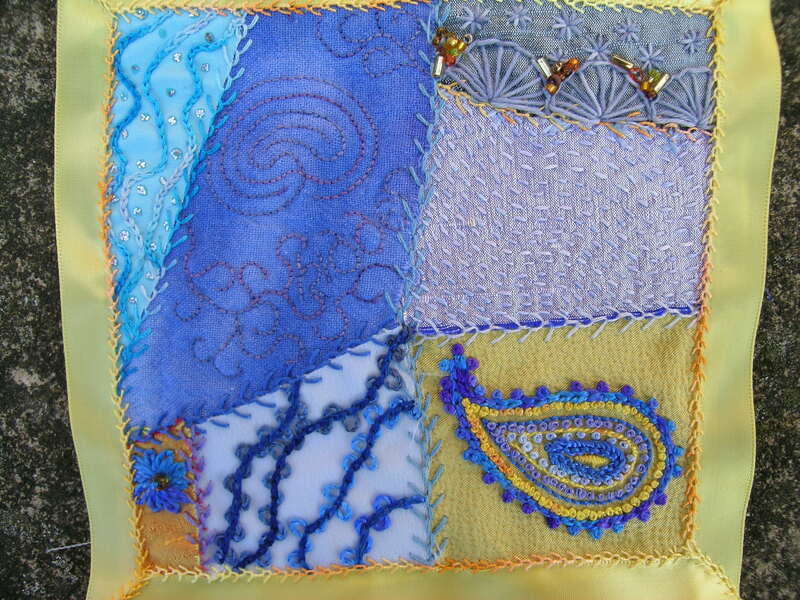 Layered paisley shape with chain stitch, back stitch, pekinese stitch (innermost blue section) and french knots. 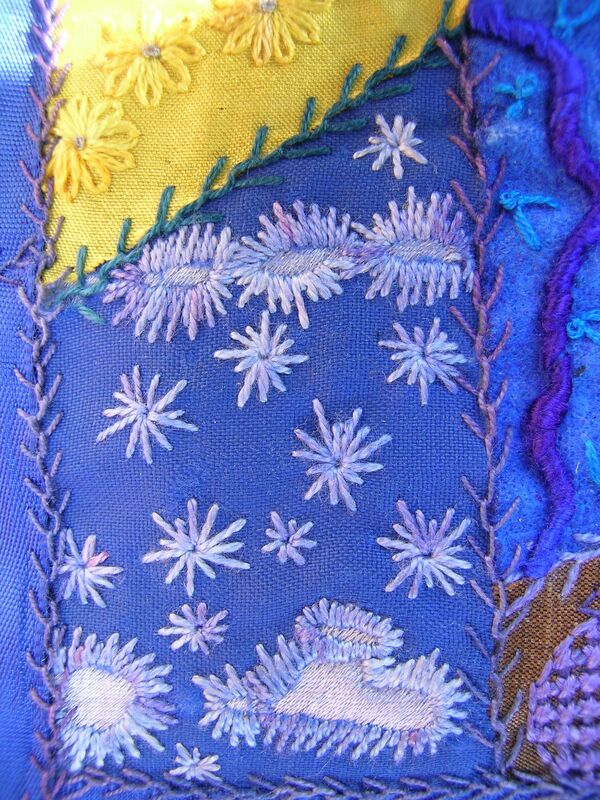 Mostly silk threads on vintage Japanese kimono silk.